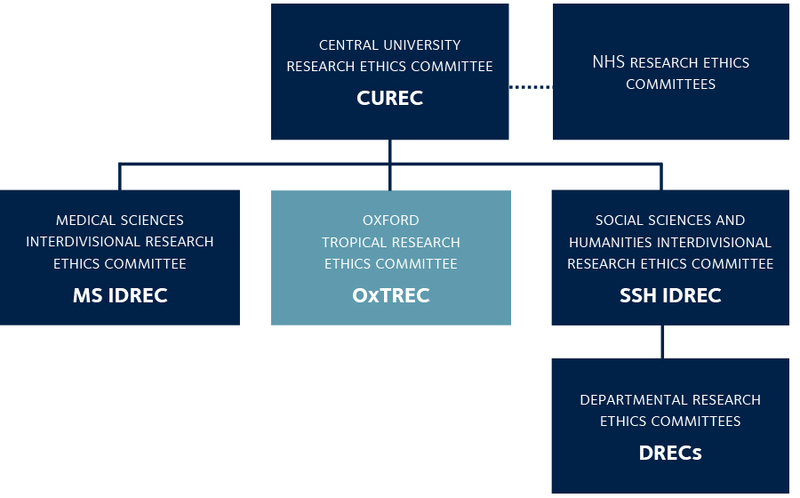 The Oxford Tropical Research Ethics Committee (OxTREC) is one of CUREC’s three subcommittees. It is responsible for reviewing the ethics of University medical research involving human participants and personal data which takes place outside the EU, or where the research is funded by the US National Institutes of Health or another US federal funding agency. OxTREC review does not replace the need for ethical review within the country where the research will take place. The committee is constituted in accordance with the University regulations on CUREC subcommittees (Part 13 of Council Regulations 15 of 2002). These regulations, in conjunction with the standing orders of OxTREC, detail the remit of the committee, its responsibilities, requirements for quorum, and requirements (for the committee and researchers) for record keeping and audit. The committee also has external members who bring valuable expertise and perspectives from non-academic and non-educational sectors. In this way it is hoped the members together reflect the interests of researchers, participants and third parties. Appointed members serve for four years and are re-eligible. For full details of committee membership requirements, see Part 13.8 of the Council Regulations. Please note: any queries about the committee should be sent directly to oxtrec@admin.ox.ac.uk and not to individual members. OxTREC delegates review of minimal risk applications to the OxTREC secretariat where appropriate. Minimal risk applications are reviewed on a rolling basis. All other applications are reviewed by the full committee, which meets six times a year. Whether a study qualifies as minimal risk or not is a decision taken by OxTREC and not the applicant. See the OxTREC application process page for further information about the application process. This table lists studies approved by OxTREC since January 2019. This table lists studies approved by OxTREC since January 2018. This table lists studies approved by OxTREC since January 2017. Is melioidosis a significant cause of febrile admissions for people with and without diabetes in Bangladesh? It was agreed by CUREC in early 2016 that, in the interest of transparency, OxTREC should make publicly available a list of studies that it has approved. The list below sets out those studies that have been approved by OxTREC since January 2016.